As I have acne prone skin, I always make sure to scrub my skin twice a week. I try to go for products that are natural as I have sensitive and acne prone skin. Today I am going to introduce you to a very AWESOME natural skincare brand ‘Raw Love Body’. I have tried their few scrubs and I must say they are the best scrubs I have tried till date. Today I am going to review Raw Love Body Tea Infused Facial Scrub. 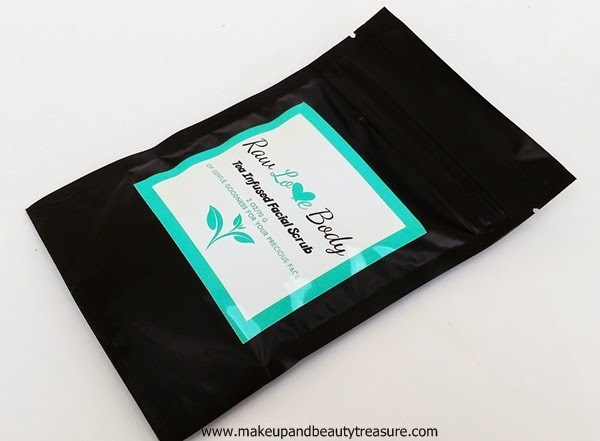 Raw Love Body Tea Infused Facial Scrub comes in a smooth, black re-sealable plastic pouch with all the information printed over it. The packaging itself screams luxury. As soon as the pouch is opened, you will find a small blue plastic spoon that helps you take the scrub out without transferring any bacteria through your hands. The peppermint scent becomes obvious and instantly makes me want to use it. 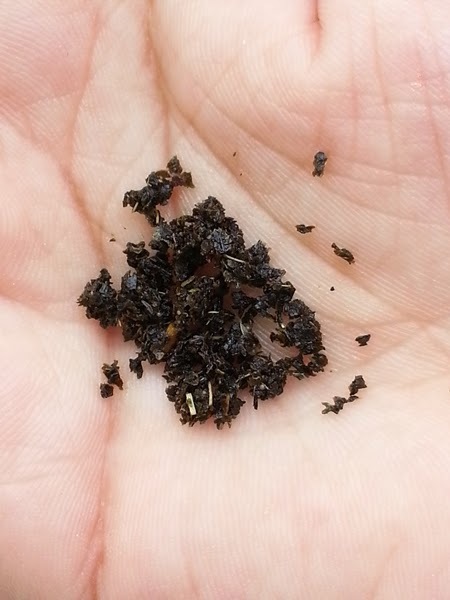 The scrub contains raw green tea leaves with various oils infused in it. The green tea leaves have been grounded so they do not feel rough on skin. I simply take half teaspoon of scrub for my face and neck and pour small amount of rose water in it (It is ready to use but I love adding rose water to get better consistency!). I then massage it all over my face and neck in light circular motions. The scrub feels very cool on my skin due to the presence of peppermint tea leaves in it. The green tea leaves feel very soft and mild on skin so even if you have sensitive skin you will love it. The scent is very mild and fresh. I then let it sit on my skin for about 10-15 minutes and then wipe off the scrub using a damp washcloth. Rinse it well with warm water to get rid of remaining tea leaves and pat it dry. My skin feels super soft, smooth and radiant. I totally love the healthy glow it gives to my skin. The green tea is infused in jasmine absolute, jojoba oil, organic honey, sea buckthorn seed oil and Vitamin E that not only slough off the dead skin cells but makes skin super soft, hydrated and radiant. It is great for all skin types. I have not faced any adverse effects whilst using it. The scrub does create a mess in my washbasin but then I love the results it gives. It does not make my skin dry and irritated and I do not feel the need to moisturize my skin immediately. It polishes my skin without breaking it out. It is 100% natural and organic and does not contain harmful chemicals. • Does not feel abrasive on skin. • Sloughs off all dead skin cells. • Makes skin very soft, smooth, hydrated and radiant. • Contains all natural and organic ingredients. • Feels cool on the skin. • THE BEST SCRUB I have tried! • A bit pricey but then it is natural! 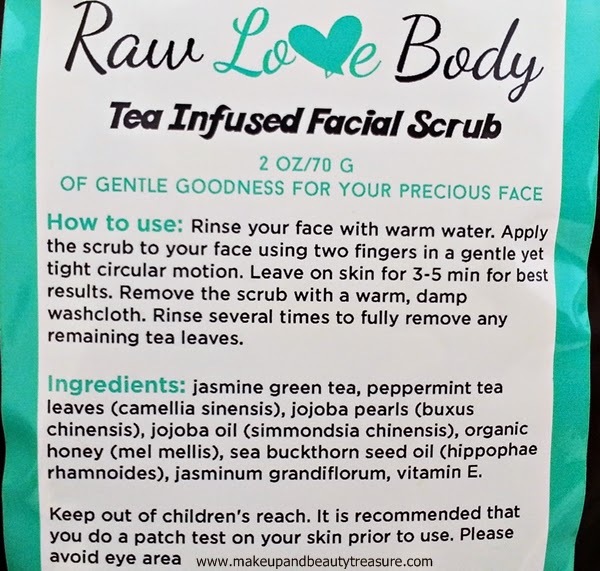 Raw Love Body Tea Infused Facial Scrub is the BEST NATURAL FACE SCRUB I have tried. It not only exfoliates dead skin cells but makes skin soft, smooth and hydrated. It makes skin radiant and healthy instantly. It feels super cool on skin so it will be my staple scrub in summers. It suits all skin types including sensitive one. I would HIGHLY recommend it to everyone! 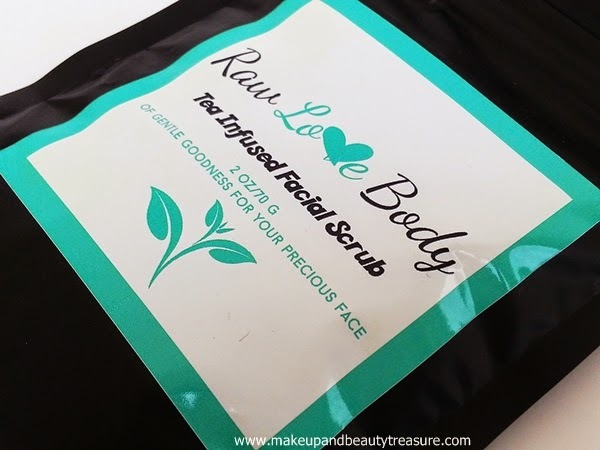 Have you tried Raw Love Body Tea Infused Facial Scrub? How was your experience? What is your favorite scrub? Share in the comments section below!